I’d tested the antenna out in my back yard, but I wanted to get it up on a summit to see how it does with a real use scenario – a SOTA activation! Black Mountain seemed like a good choice for this, since it’s local and a fairly quick hike. It’s also a gently-sloped grass-covered summit, with soil not too dissimilar from my back yard. Since I wouldn’t be bringing any SWR-measuring device, I wanted to keep things similar to the back yard setup to try and be easy on the finals of my MTR-3B. In retrospect, it wouldn’t have been too much trouble to bring along my K6BEZ antenna analyzer. I may do so on the next few summits, until I’ve seen what different ground makeup does to the SWR. Anyway, Black Mountain would be it, so here we go. 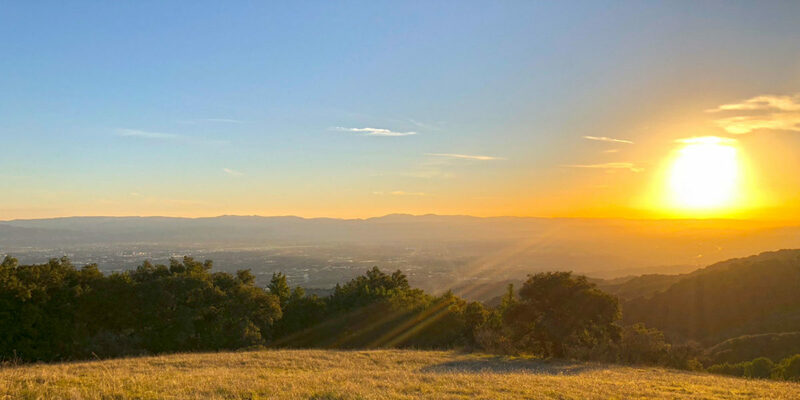 On my first attempted activation of Black Mountain, I’d brought just a small handheld (my Yaesu VX-2r), since I’d run to the summit through Rancho San Antonio – a round trip of over 10 miles and lots of elevation. My first successful activation of this summit involved a short walk up to the summit from Black Mountain Backpack Camp. I was camping there as my “Winter Field Day” spot. It’s a nice little local place to get away from the city for a little backpacking. For this activation, I decided to take the same route, coming from Page Mill Road, up past the backpack camp to the summit. It’s very beautiful. The park officially opens a half-hour before sunrise, so I planned to be there around that time. As expected, when I arrived, the gate wasn’t yet open, but there was space on the side of the road to park. Starting out, the glow of dawn made the sky an assortment of rich colors, with the moon reflecting the sun’s approaching light. Entering the trail at the south end of the lot, there’s immediately a fork. It doesn’t matter which way you go—you’ll end up in the same place at around the same time. I don’t know the name of this part of the trail, but it goes downhill to the Canyon Trail, and it’s got some amazing views. Once the trail meets with Canyon Trail, you’ll turn right and follow a creek for a bit. Then you’ll turn left at another fork to start your climb to the top, on the Bella Vista Trail. Once you near the top, there are multiple choices for getting to the top. You can stay on the trail, or jump over onto Monte Bello Road. I chose to get onto the road, to save a bit of time. I’d been a bit optimistic with the time I posted I’d be on the summit. I like to make it on time if possible. Shortly after getting on the road, I passed backpack camp. There were a few people at the individual sites, and what looked like a Boy Scout troop at the larger group site. Right after passing backpack camp, the summit is in view. There are lots of antennas on this summit. I believe many of them are public service repeaters, telecom, etc. And of course, several of the BayNet repeaters are up here. As I discovered on my first attempted activation, the RF emitted up here makes it very difficult to do a VHF/UHF SOTA activation. Now that I have a little more experience under my belt, however, I think I could make it happen. Just past where the towers are, is the main summit area. It’s a pretty flat summit, with a bunch of rocks one could sit on, or set up as a table for a little picnic. It’s also the primary area the many visitors of the summit like to hang out. I would not be setting up there. I went onto a little spur trail leading to the east side of the summit. It still gets visitors, but has much less traffic. Also, I’d be taking advantage of the east-facing slope to help launch those signals nice and low/far. Arriving at the end of the spur trail, I plopped my bag down and enjoyed the view for a moment. It would be the view I’d be enjoying for the whole activation, but sometimes it’s nice to just quietly absorb the moment. I’d already practiced setting up the new antenna in my back yard a few times. The last thing I want when I get to a summit is to be figuring out how I’m going to do something. It’s already enough work sometimes, figuring out where I’m going to put my 60+ft end-fed half-wave antenna. At least in this case, I wouldn’t have to find a very big space for my antenna. Being a vertical antenna, it requires only the 20 feet of horizontal space for its radials (the four radials are 10 feet). I got the mast staked out using my new ice cream lid guying collar, and had the antenna vertical within about 5-10 minutes. Easy! I planned on doing 30 meters first, then 20 and 40 meters. Not sure why I like this order, but it works. I figure as long as I have a usual pattern/plan, my chasers will know what to expect. I sat down and started calling CQ – no self spotting. I relied on the Reverse Beacon Network (RBN) and RBNHole (the automated SOTA spotter) to get spotted. It seemed like it took a little longer than usual to get spotted, so I started doubting the antenna right away. The poor thing. Of course, as the new piece of equipment you’d expect it to get some blame if things don’t go as planned. But more than that, I know it’s not a full-size antenna. And a shortened vertical with only four 10-foot radials can’t possibly perform well, right? Wrong. It wasn’t long before the contacts started rolling in. I got four contacts on 30 meters, before switching to 20 meters and resuming there. On 40 meters, results were equally excellent. Reports were good, signals strong and clear. Of course, one of them was line of sight (hi Vic! ), but the ones that weren’t came through nice and clear, too. More importantly, the signal reports I was receiving were pretty good, too. And I’m pretty sure most of them were honest. So far, I’d have to say this new antenna is a really great option for summits where I can’t or don’t want to set up the full-size half-wave antenna. I need to do some more testing, seeing how the antenna does on summits with different soil composition (or no soil composition), such as some of the rocky granite and volcanic peaks I’ve done. I got a couple of contacts on 2 meters while packing up and starting the hike back down. I found that if I got on the west side of the towers, there was a lot less interference, and I could still see San Fransisco and Oakland. The hike back down was pleasant. I even talked to a guy whose father had been a ham and now wanted to get back into the hobby at the age of 90. I sent him some info to get things started. 16:05z EA2LU 14MHz CW Spain! TU Jorge!